The vast majority if veggies and fruits bought from markets are usually covered with pesticides. According to some reports, berries, peppers, peas, grapes, beets, celery, apples, leafy greens, broccoli and tomatoes are the fruits and veggies that are usually most exposed to pesticides. Even though pesticides are used directly on the stems and leaves, a significant quantity of pesticides is transferred on the veggies and fruits too. By using warm water to wash them thoroughly, you will be able to eliminate these harmful ingredients before you eat the food. Extremely cold or hot water won’t aid your efforts to eliminate all the pesticides from the foods. Just use warm water and it should be fine. As we have already mentioned, there are specific veggies and fruits that have more pesticides than the others. Before you use produce like this, fill a large bowl with water and pour ½ a teaspoon of table salt in it. Next, put the fruits and veggies in it to soak. Leave them for 3-4 minutes and after that use regular water to rinse them one more time. In order to get better results, you can use commercial washes specially designed for this purpose like Vegfru. What matters the most is to wash these foods before cooking. The majority of pesticides are loaded with organochlorines, organophosphates, sulfonylurea, carbamates, pyreathoids and other similar compounds which put our health at risk. These pollutants have the ability to penetrate the outer layer of fruits and vegetables and reach the peel. The good news is that you don’t have to purchase expensive commercial fruit and veggie cleansers when you can make one at home. Simply, take one teaspoon of apple cider vinegar and place it in a fruit bowl and use some water to dilute it. 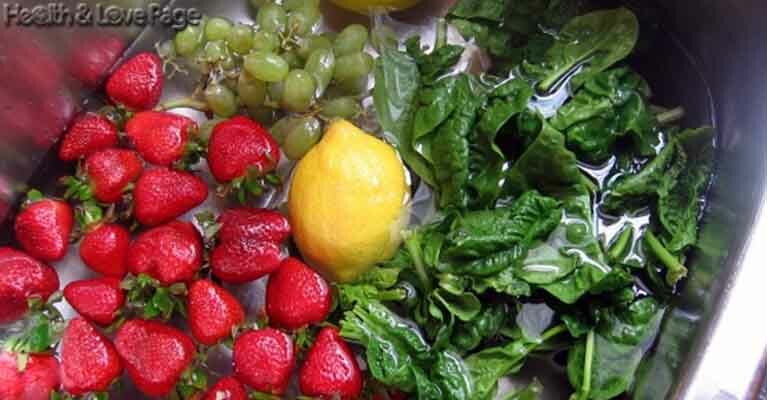 Put the veggies and fruits there for a while and use tap water to wash them in the end. When it comes to veggies and fruits like avocados, onions, apples, potatoes, mangoes, oranges, carrots, ginger, beets and radishes it is quite simple to remove the skin. Once you remove the peel, wash the produce thoroughly again. Veggies and fruits that require additional care are the ones with pesticide buildups. Take two tablespoons of baking soda and one tablespoon of lemon juice and mix them well. After that, dilute this solution with one cap of tap water, place the solution in a spray bottle and spray the foods. Don’t use dish soaps or detergents to clean the foods because they can be dangerous too. Cleaning and washing veggies and fruits before cooking is a must. Take a damp cloth and wipe the entire surface right after rinsing with tap water. By cleaning the fruits and veggies with a cleaning cloth you will be able to eliminate any traces of pesticides present on the surface. With the help of these tricks and tips you will be able to kill almost 90% of the pesticide traces from veggies and fruits. Besides these tricks, you can also blanch the foods whenever you can for even better results. Purchasing veggies and fruits from local sellers is another method you can use to avoid pesticides. Organic foods can also be bought because they are grown without pesticides. The only downside is the fact that they cab be costly. Finally, consider growing some of these foods at your home to avoid pesticides.